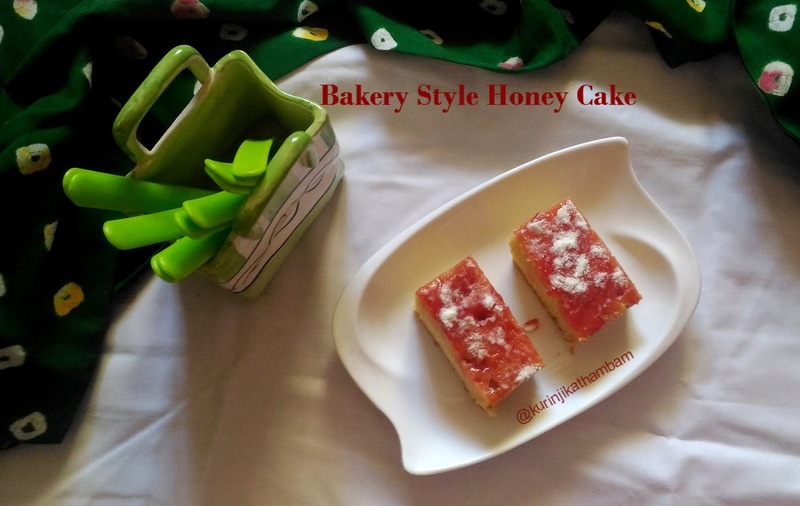 Honey cake is a very popular cake and all bakeries have them always. 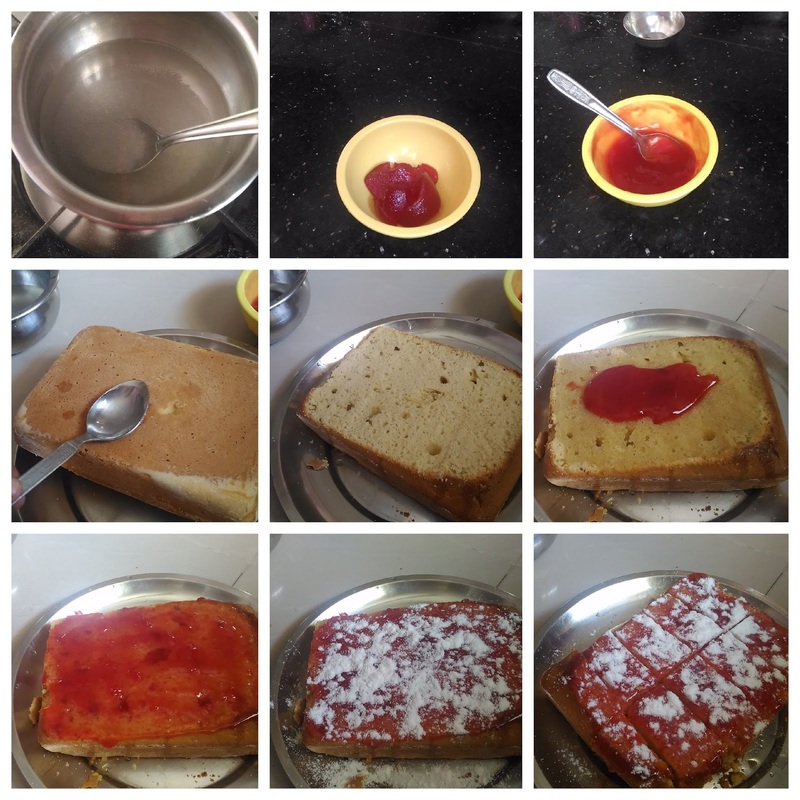 It will be good to make it at home itself and everyone will appreciate the healthiness of homemade cakes when they have it (as they can easily compare with the taste of bakery honey cake). Click HERE to view cake recipes. 1. Bake one sponge cake either with eggs or without eggs from the above links. Allow it to cool down completely. 2. If you have thick crust, them remove the crust from the cake. Otherwise use the cake as it is. 3. Heat the water in a pan. Add granulated sugar and boil till the sugar melts completely. 4. Add vanilla essence and mix them well. Keep it aside. 5. Add the jam in a bowl. Add warm water and mix them well with the spoon. 6. Mix them well till the jam mixture reaches pouring consistency. Keep it aside. 7. Turn over the cake and pour the sugar syrup (from 4) little by little, till all the sides become wet. 8. Again turn over the cake and pour the remaining sugar syrup little by little, till all sides of the cake become wet. 9. Now spread the jam liquid (from 6) gently over the cake. 10. Then sprinkle the desiccated coconut over the jam spread. 11. Then cut it into small rectangles and serve. 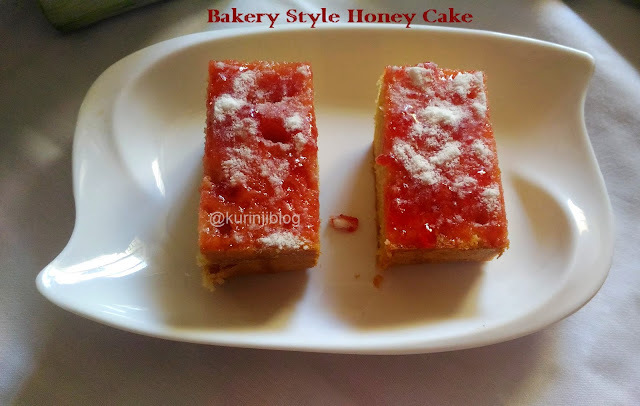 Yummy and delicious honey cake is ready to serve. 1. The measurement for honey cake is for the cake with 1 cup of flour only.